The Irish Gift House: The new Irish & Celtic jewelry from Solvar is on the way. The new Irish & Celtic jewelry from Solvar is on the way. Just this Thursday Kerry and I were treated to the new Irish and Celtic jewelry from Solvar. Dave Duggan, the US Sales Executive for Solvar Jewelry, made his annual pilgrimage from Massachusetts to Phoenix, Arizona to show us all the new product. As usual it was well worth everyone's time; Dave showed us about 200 exciting new pieces that ranged from Claddagh rings to the Tree of Life jewelry, and we bought just about every one! We will receive the first batch of Solvar jewelry from Ireland by mid September and we will be busy publishing the new product to theirishgifthouse.com. You may check our New Irish Gifts page to see how we are progressing. 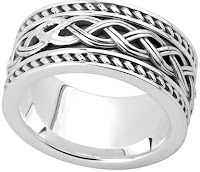 Solvar has always been known for their eclectic style of jewelry that ranges from traditional Irish jewelry to Celtic designs that imitate the popular trends to completely innovation designs. One of our favorite new designs included the heaviest and thickest Celtic wedding bands that were amazingly comfortable to wear. Another of our favorites are some of the lightest Celtic necklaces and earrings that feature a puffed dimensional design, but were hollow inside. Solvar has always been a leader in Connemara marble jewelry and this year was no exception. Some of the new designs featured facet cut Connemara marble; we had never seen this unique style before. From looking at the new line there must be a resurgence in Celtic brooches as more new designs were offered than in previous years; we are not complaining, a handsome brooch can be the perfect accent to any outfit. And Solvar also had more harp jewelry than in recent visit; as I'm sure you know, the harp is Ireland's national emblem and it is present on all official documents. We also selected some gold Celtic cross necklaces with large lab created emeralds. The lab created emeralds look brilliant and by using them, Solvar is able to keep the cost down. We can't wait until we get this new Solvar jewelry published to our site; we better get busy!